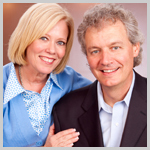 Founded in 1984 by Keith & Heidi Hershey, Mutual Faith Ministries was established to help people join their faith to increase dynamic life-giving assistance in the nations of the world. From the headquarters location in San Fernando, CA, MFMI helps raise up leaders to spearhead regional and national offices around the world. Each team operates autonomously, yet works in fellowship and under the direction of the USA office. Each team’s function and ministry expressions varies, based on the calling and gifting of the local leadership, as well as the needs of individual communities and nations. Presently, MFMI has regional offices in Costa Rica, the Philippines, Nigeria, Ghana, and Lebanon. There are also registered support offices in England, South Africa and the Ivory Coast. They now have Mission Centers in many parts of the world. They also host a weekly television program, L.I.F.E. Unlimited, airing in over 120 nations and is translated into Arabic, Spanish and Russian.